As I have documented previously in this space, this blog was conceived as a replacement for a monthly e-newsletter that I had written dutifully, every month, for 10 years starting in 1996. As such, the fact that email subscriptions have played such a key role in the blog’s growth since then is not (alas) a result of any great strategic foresight on my part. In fact, quite the opposite – initially, the blog itself was simply the permanent repository for the content broadcast monthly to email subscribers. Why then, I ask you, don’t more bloggers cultivate email subscribers? Say what you will about the potential for RSS, an email subscription gives you more information about your readers (starting with their email address) and has just as much viral potential. If the only subscription option on your blog is RSS (or Twitter, basically the same thing for the purposes of this discussion), it may be less work, but you’ll be missing out on a vast, untapped audience of potential subscribers and prospective clients. 1. When someone subscribes to the blog (via a registration form hosted in Marketo), that information is captured and ported automatically into Salesforce.com. We’re alerted to new subscribers – as with any new sales lead – via email alerts generated instantly by Marketo. 2. Once a month, our production manager copies the RSS feed from the previous month’s posts and pastes it into the email template hosted within Marketo’s built-in design studio. Some minor formatting, a quick review by yours truly, and the email is ready to go. The subscription list, updated in near real time from Salesforce.com, is pulled down from Marketo. 4. As you’ll see in the design above (right-hand sidebar), the newsletter also offers up downloadable content: white papers, podcasts, and the like. Those offers also link to registration forms hosted in Marketo. If a subscriber clicks through to any one of those forms, his or her contact information will be pre-populated on the form, which, naturally, does wonders for conversion rates. Here again, any form submissions make their way to Salesforce.com, generate an instant email alert to our business development team, and update the activity history for that particular contact. We choose to manually respond to these leads via Salesforce.com email templates (call it the human touch), but it would be a simple matter to have Marketo generate personalized thank you emails, automatically. Conceivably you could broadcast a similar blog newsletter using most any email broadcast software, or a third party service provider, but my guess is that it wouldn’t be this simple a process, nor would you benefit from the Salesforce.com integration, tracking, and “smart” (read: pre-populated) forms that we get with Marketo. 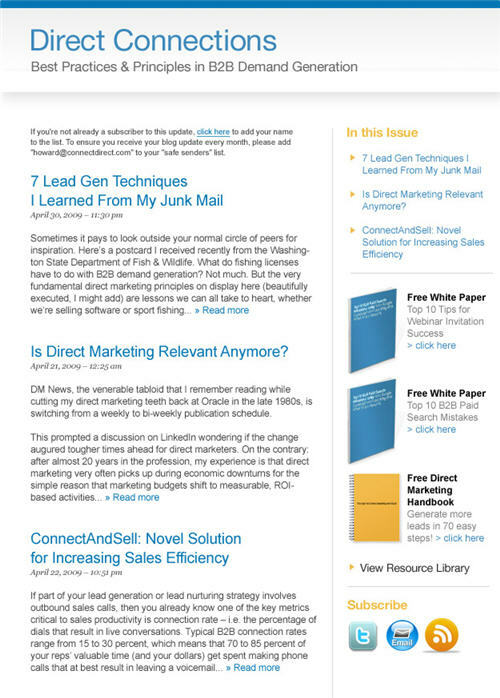 The very first post to this blog back in April 2007 exhorted marketers to dump their e-newsletters and convert them into blogs. I stand by that advice today. Now that you have your blog, however, don’t ignore the potential of email subscribers. They could be your blog’s best friend. This entry was posted in B2B Marketing, Blogs, E-mail, Installed Base Marketing, Lead Management, Lead Nurturing, Marketing Automation, RSS, Social Media and tagged blog promotion, Blogs, email marketing, enewsletters, Social Media on May 28, 2009 by Howard Sewell. This is a great post. I wrote about this a while ago but it didn’t get much traction. Nice to see an actual case study. You can take this a step further by having the blog post automatically displayed in an email if you could add an RSS feed to an email. Nice stuff and I really like the look of the email. Is it possible that you can detail Step 2…what exactly does the production manager do; reformat the RSS feed? David, quite literally the process is a copy and paste of the RSS feed (or even the excerpts as they appear on the main blog) into the email template – it really is that simple. Great…I look forward to taking on this great idea. Thanks! Just to let you know that we actually created a RSS-to-Email application for Marketo. You can have a look here. It basically remove the manual part of copying and pasting the blog content into the Marketo email.